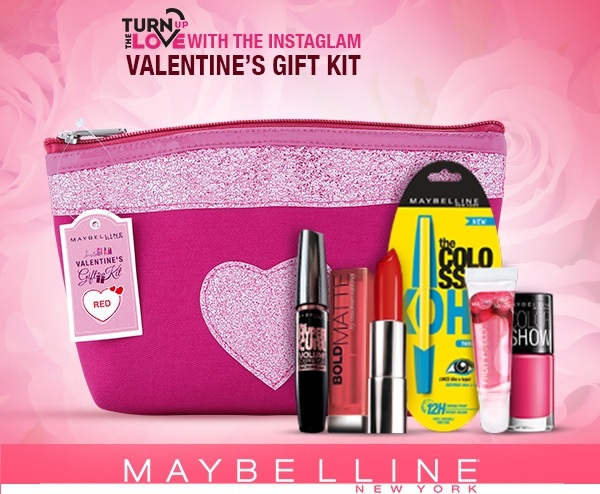 I will be reviewing this cute Maybelline Instaglam Valentine's Gift Kit. 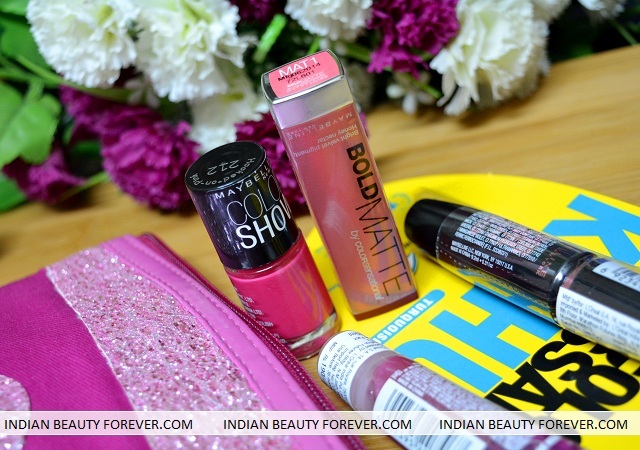 Maybelline has already come up with such cute yet very handy kits filled with makeup. Now what else a girl can ask for other than the makeup unless you aren’t a makeup buff like us. 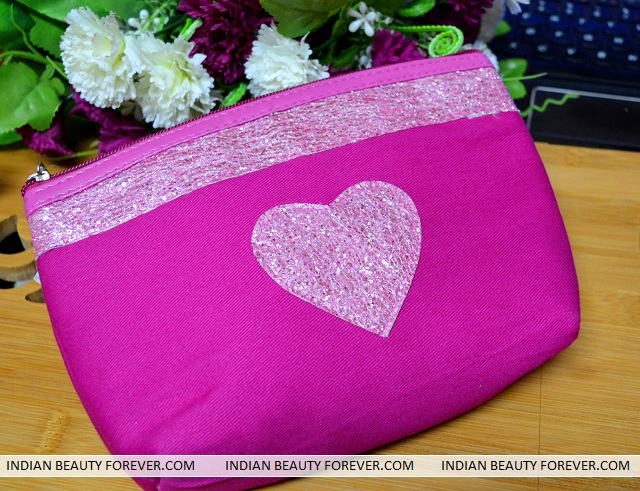 This kit is for 999 Rupees and contains 5 products, so in 999 Rupees you will get 5 products and this lovely pink zipper pouch with a heart attached to it. Get it here online. 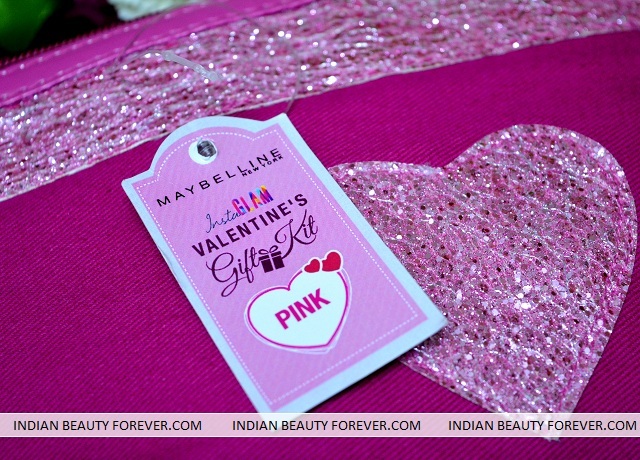 This Maybelline Instaglam Valentine's Gift Kit comes in three variants like Red, Pink and Coral. I have the pink one with me. I like pouches a lot since they can e used in loads of different ways like to gift someone with some goodies inside or to keep some jewellery or the makeup products inside our big handbags so that while searching for a lipstick for touch up you don’t end up taking out everything that you feel could be a lipstick. The kit has these 5 Maybelline products. 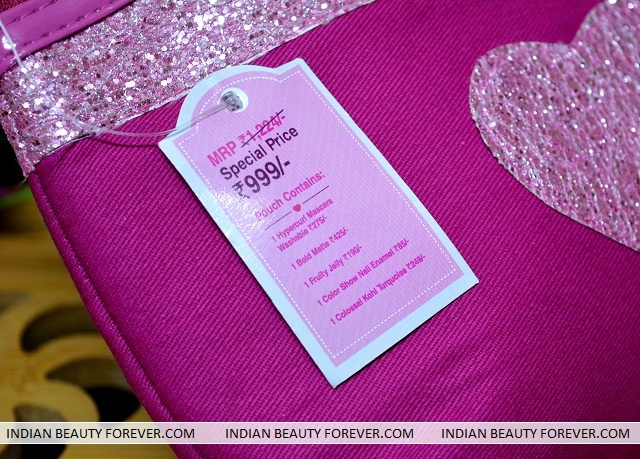 This kajal has already been reviewed on my blog and it costs rupees 249. It is smudge proof and has a good pigmentation. I have reviewed Bold MAT in no 5 earlier so BOLD MAT 1 will be good to try. It’s a pink color by the way which is suitable for day time wear. It costs rupees 425. These lipsticks are very light weight and I like their texture which isn’t matte but not too creamy. I loved red and pinks when it comes to nail polishes. Maybelline Colorshow nail pain range is already a hit and I have over a dozen shades from this range. Therefore, an extra addition to my collection is always welcome. It costs 75 rupees. I still remember when I started my blog this mascara was amongst my five reviews and I still love it. Have already got 2-3 tubes of this mascara since then so this tube would be my back up. It is really good to give extra volume. By the way, while I am writing this, I am thinking a kit like this can be a good gift idea especially for those who like makeup products. I have tried almost every product of Maybelline but surprisingly I haven’t tried this lip gloss yet. I am excited to swatch it now. This gloss is for 190 Rupees and can be bought in 8 different shades. So, did you girls liked the kit? I think it's worth the money especially for the beginners.